Good Life Connoisseur | Snowbirds Nest in the U.S.A.
Home » FEATURED » Snowbirds Nest in the U.S.A.
Buying a vacation home in the U.S. is a dream that has become reality for many Canadians. The top five snowbird destinations – Florida, Arizona, California, Hawaii and Texas – are already home to thousands of snowbirds and Canadian permanent residents. Whether you already own property in the U.S. or are simply entertaining the idea of entering the U.S. real estate market in 2014, there are several U.S. tax and legal developments to consider this year. Canadians who own assets in the U.S. may be subject to U.S. estate tax. This tax is based on the fair market value of all U.S. assets owned at the time of death. It can climb up to 40% depending on the value of the U.S. asset and the value of the worldwide estate. Is the value of their worldwide estate greater than $5,340,000? If the answer to the first question is yes, but the second question is no, then Canadians are exempt from paying U.S. estate tax. The $5,340,000 exemption amount is current for 2014 and will rise with inflation in coming years. So, if a Canadian owns a U.S. vacation property worth $1,000,000, but his or her worldwide estate is $3,000,000, that person will not owe U.S. estate tax upon his or her death. It is important to note that everything is included when calculating a Canadian’s worldwide estate, including RRSPs and life insurance. However, the Internal Revenue Service (the “IRS”) does not tax 40% on the value of the worldwide estate – only the value of the U.S. assets are taxed. There are ways to structure your ownership of U.S. assets in order to minimize or eliminate U.S. estate tax, so you should consult a cross-border professional if you think you might be exposed. In June 2013, the U.S. Senate approved an immigration reform bill that, if made into law, will overhaul the U.S. immigration system. Despite the controversy surrounding the bill (House Republicans are opposed to it, primarily because of its aim to create a path to citizenship for illegal U.S. immigrants), the bill is likely to be passed in piecemeal fashion starting in 2014. Generally, from an immigration perspective, Canadians can spend six months in the U.S. in a rolling twelve-month period, or 180 days in a rolling year. The bill proposes extending this to eight months, or 240 days, in a rolling twelve-month period for those Canadian citizens who are over age 55, maintain a residence in Canada, own or rent a residence in the U.S. and who will not work or seek public assistance in the U.S.
Another important proposal included in the bill is the retiree visa, which would allow Canadians who meet the above criteria to obtain a renewable three-year visa as long as they could show that they have purchased one or more properties in the U.S. worth a combined total of at least $500,000 USD, have U.S. health insurance coverage, and reside in the U.S. for at least 180 days per year. 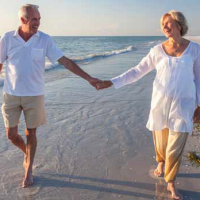 While these reforms seem like winning solutions for snowbirds looking to spend more time in the American sun each year, there will be important factors to consider before capitalizing on them if they do come to fruition, such as tax implications and provincial health care coverage. The rules around the number of days you are allowed to spend abroad without affecting your residential status – and therefore your provincial health care coverage – vary by province. Most provincial health ministries require physical presence in the province for 183 days per calendar year or 183 days in any twelve-month period. It is possible to extend your health care coverage if you will be out of your province for a longer period. In Ontario, for example, you will be able to retain your provincial health care coverage if you are out of the province for as many as 212 days in any twelve-month period as long as Ontario is still your primary place of residence. If you will be gone for more than 212 days, you may apply for continuous health care coverage, but there are specific requirements that must be met to qualify. Spending too many days in the U.S. also puts snowbirds at risk of being designated as U.S. residents for tax purposes. The IRS calculates residency based on a complicated formula known as the Substantial Presence Test (“SPT”). Many Canadian snowbirds think that if they spend less than 182 days in the U.S. per calendar year, they will not be considered U.S. residents for income tax purposes. However, if you meet the criteria of the SPT, you may be considered a U.S. resident. To be considered a U.S. resident under the SPT, you must be in the U.S. for at least 183 days during a three-year period that includes the current year and the two years preceding it. If the result is 183 days or more, then you may be taxed as a U.S. resident, on your worldwide income. As you can appreciate, it is better to steer clear of these complicated calculations. There are, however, circumstances that may exempt you from the consequences of the SPT. If you have spent less than 182 days in the U.S. in a calendar year and can clearly show that you have a closer connection to Canada than the U.S., the IRS will treat you as a nonresident regardless of the SPT. To claim the exemption, you must file Form 8840 with the IRS. If you have been in the U.S. for more than 182 days in a calendar year, then you have the option of filing a treaty-based U.S. tax return so that you are only taxed by the IRS on certain U.S. income. Income earned outside the U.S. would be exempt. Although it is difficult to say when the immigration reform bill will be signed into law, 2014 marks the year of increased vigilance regarding border crossings between Canada and the U.S. The “Entry/Exit Initiative,” a cooperative endeavour between Canada and the U.S., will implement its final phase on June 30, 2014. After this date, Canada and the U.S. will begin sharing border crossing information with each other. The initiative aims to use the record of a land entry into one country as an exit record from the other. This means that the number of days a Canadian snowbird is present within the U.S. will be much more clear. Snowbirds will have to keep close watch on the number of days they spend in the U.S., acknowledging the residency rules regarding taxation. Additionally, Canadian snowbirds who spend more than 180 days in the U.S. in a rolling twelve-month period without a proper visa may be considered unlawfully present. Now that day counts will be monitored more accurately, the chances of being deemed unlawfully present in the U.S. will increase. The consequences? A three-year travel ban to the U.S. for being unlawfully present for between 180 and 365 days or a ten-year ban for being unlawfully present for more than 365 days. The Patient Protection and Affordable Care Act (“Obamacare”), which was adopted in 2010, brings major health care reform to the U.S. As of January 2014, under Obamacare, green card holders and lawful temporary residents of the U.S., such as Canadian snowbirds, can no longer be denied health insurance because of pre-existing medical conditions or because they are over the age of 65. Canadian snowbirds over 65 who have held their green card for a minimum of five years are eligible for U.S. Medicare. But what do you do while you wait for the five years to elapse so you can get Medicare? You obtain private health care insurance. Prior to Obamacare, however, Canadian snowbirds over 65 had great difficulty doing so because of their age – especially if they had any pre-existing medical conditions. Obamacare is good news for Canadian snowbirds. The U.S. legal and tax landscape is complex, but that is no reason to shy away from enjoying the sunbelt to the south. With the right planning and guidance from cross border professionals, Canadian snowbirds will be well equipped to nest in the U.S. in 2014 and beyond.